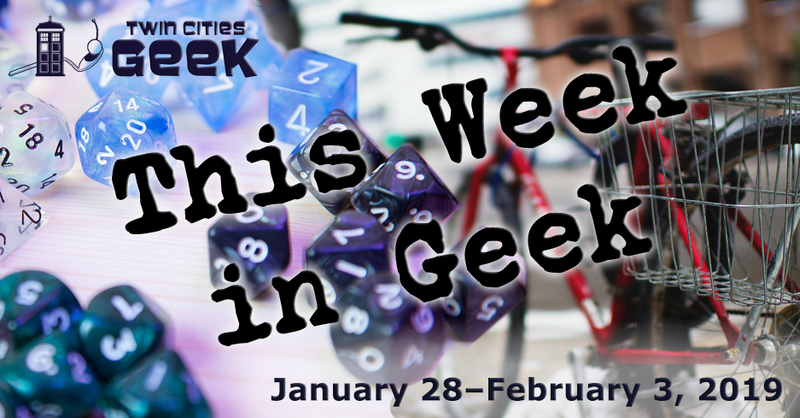 Welcome to This Week in Geek, your guide to events of interest to the Minnesota geek community for the week of Monday, January 28th to Sunday, February 3rd. Winter is here. Enjoy something that sets the Twin Cities apart from most other major metro areas in the country, and brave the extremes that winter can bring with your community. Enjoy a variety of special events including ice bars, winter concerts, ice palaces, parades, and more, as well as art and fun for the whole family. Most events are free and open to the public. When: Monday, January 28th at 6:30 p.m. When: Tuesday, January 29th at 5:00 p.m. When: Tuesday, January 29th at 7:30 p.m.
Come and experience YogaQuest, a blend of yoga and fanfiction storytelling led by certified yoga instructors. Experience a yoga workout experience and a story at the same time. The theme for this week is to be determined, so be ready for anything, and check the Meetup group as the event gets closer. This event is winding down, and will be replaced by online classes in the near future. When: Wednesday, January 30th at 7:00 p.m. This regular event at Modist, hosted by Sam Spadino and Bacon, represents the convergence of two geeky favorites: a brewery that geeks out for innovative beer and absurd trivia. Trivia Against Humanity also has weekly events at Mortimer’s on Tuesdays. See the Trivia Against Humanity Facebook page for additional events. The City of Lakes Loppet is featuring the Urban Cross Country Ski Festival, an opportunity to see a variety of winter sports and enjoy a warm sense of community in the cold. The Loppet returns this year with the Luminary Loppet, an illuminated celebration of winter in the Twin Cities, accompanied by a beer garden and party. There are events starting on Thursday evening, including a variety of races; see the website for more details. When: Thursday, January 31st at 7:00 p.m. When: Friday, February 1st at 6:00 p.m.
SuperCon returns for the 26th year—as the organizers note, the first such event was during the last Super Bowl hosted in Minnesota. SuperCon promises a relaxing weekend of geeky fun in a laid-back Hastings setting. Expect a video room with constant screenings, space for gaming, space for libations, chilling, and connecting with new and old friends. Registration is $50. When: Friday, February 1st at 7:00 p.m. The Level Up board-gaming community will be hosting a weekly board-game tournament with promos, prizes, and a chance to learn new games and meet fellow board-game geeks. This event will continue weekly until further notice. Entry for this event is $5, and there will be a different featured game every week. When: Saturday, February 2nd at 10:00 a.m. When: Saturday, February 2nd at 12:00 p.m.
Take a deep dive into the extraordinarily small world of your immune system, and the tiny defenders that constantly battle to keep you alive. This monthly program at Metro State seeks to improve accessibility to science with open programs that can lead folks towards scientific careers, or just greater curiosity. No RSVP required, though young people under the age of 18 should be accompanied by a parent or guardian. When: Saturday, February 2nd at 1:00 p.m.
Time-loops! Virtual immortality! Bill Murray! Come see the ’90s classic of self-discovery and heady science-fictional concepts made palatable for general audiences. The Parkway—a local theater with a long history in south Minneapolis—will be screening a digital version of the film. Tickets are $7 in advance, or $8 at the door. When: Saturday, February 2nd at 6:30 p.m.
Science and comedy go together as well as peanut butter and chocolate, because the universe itself can be so huge, confusing, and absurd at times. This event, led by Shane Mauss, brings you a little bit of science with your comedy, and will begin with nerdy comedy from the host before he introduces his guest speakers: Colin DeYoung, Mike Lester, and Bob Krueger. These three guests include a stand-up comic responsible for the “Beware of Brobots,” campaign, and two distinguished professors who work on personality, psychology, and genetics. Tickets are $18. When: Sunday, February 3rd at 10:15 and 11:15 a.m. This class incorporates a variety of dance styles, including tribal fusion, Greek, American Egyptian, and world fusion and is taught by instructor Shannon (whom readers might know from Geek Slink Belly Dance). These weekly classes will help build a strong core and set of skills, and is intended for all bodies, all ages, all sizes, and is built on a platform of acceptance and inclusivity. Cost is $15. Please note: there are two different classes offered on Sundays. The 10:15 class is intended for all skill levels and beginners may find more forgiving, while the 11:15 class is for an intermediate skill level. When: Sunday, February 3rd at 11:00 a.m.
As the Doomsday Clock ticks closer to midnight, come and enjoy a brunch full of Cold War and ’80s nostalgia. WarGames—the 1983 film starring Matthew Broderick—is a cautionary tale about the dangers of hacking into the US missile defense system with all of the high-powered computing technology of the early 1980s. Tickets are $7; brunch is not included in the price of tickets. When: Sunday, February 3rd at 12:00 p.m.
Come get your game on with a game-master with an epic pedigree, who’s been running and playing role-playing games since the 1970s (and with foundational contributors to the hobby, like Dave Arneson). Expect a table-top game of epic proportions, with polyhedral dice flying, and fun had by all! Check the meetup page for more details. When: Sunday, February 3rd at 5:00 p.m. This weekly event gives families a chance to experience virtual reality, soda, and pizza for a special price at REM5 Virtual Reality Laboratories. This is a great opportunity for families of all types (K–12, college, etc.) to explore virtual reality in a great Saint Louis Park location. There’s a wide variety of possibilities here, including fun, education, and more; see the website for more details. This event is $20 per person, which covers one hour of VR, pizza, and soda.